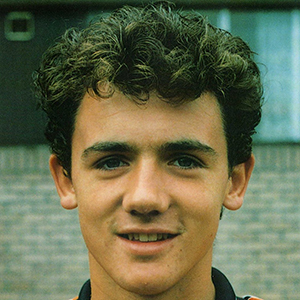 An 'S' Form signing, Christian was already a Scotland schoolboy and Under-15 international, playing in the United reserve team when he signed professional terms in August 1990. The young striker made a scoring competitive debut in a League Cup match away to Alloa Athletic and became the youngest player to make a Scottish Premier Division debut four days later against St Johnstone. Still appearing sporadically at Youth level - he was in the successful BP Youth Cup sides in 1990 and 1991 - he became the youngest player to appear for his country at under-21 level when he featured at the age of 16 against Romania at Easter Road. Injury side-lined him for a large part of 1991-92, but he gradually worked his way back into the first team and began appearing regularly again towards the end of the 1992-93 season. 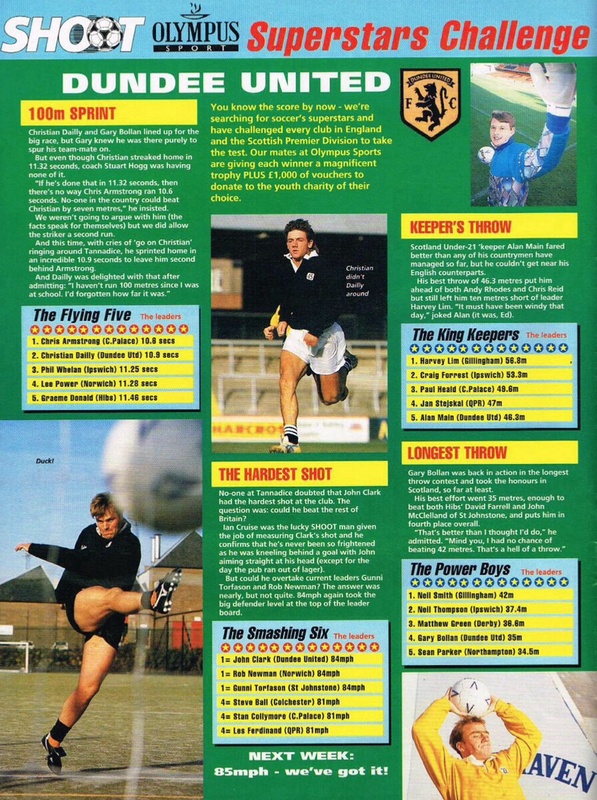 By the time Christian was too old to continue playing for the Scotland under-21 side, he had collected a World record number of caps for that level, and in May 1993 he was included in the full Scotland squad for the first time. 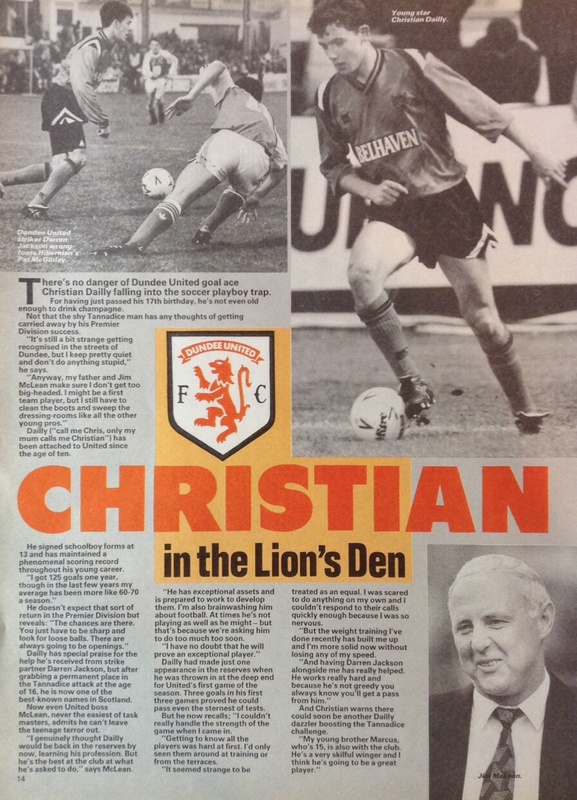 Christian made a highly significant contribution in 1993-94. 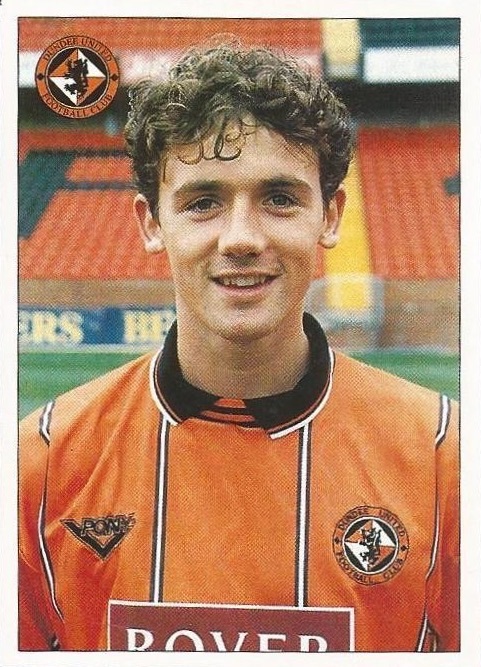 Having firmly established himself as a regular during the season, he was named in the starting eleven for the 1994 Scottish Cup final at Hampden. 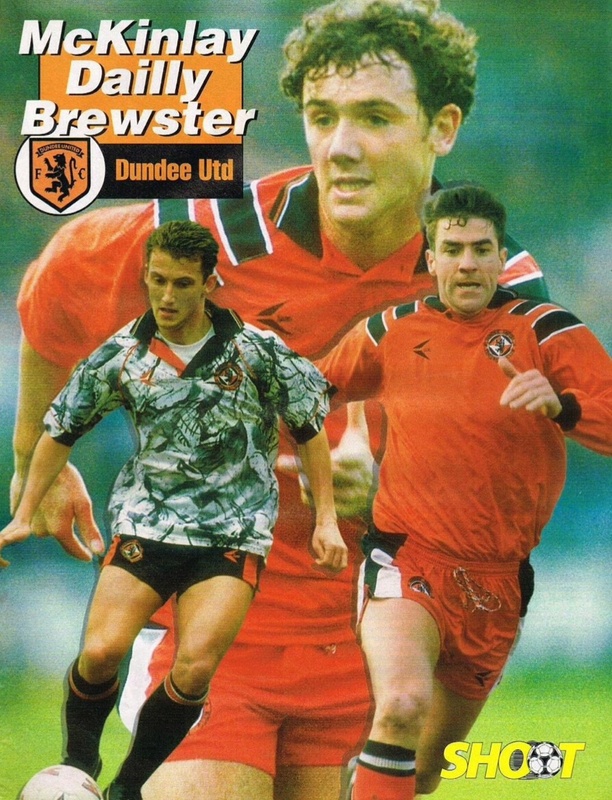 He stretched the Rangers defence throughout and it was his quick thinking which led to Craig Brewster’s winning goal, as United won the trophy for the first time in the Clubs history. Christian evolved into a defensive player over the next two seasons, as United suffered the disappointment of relegation, and became club captain at the start of United's bid to gain promotion back to the top league. His vital goal in the away leg of the play-off against Partick Thistle was instrumental in United gaining promotion at the first opportunity. This proved to be his final game for United, as in July 1996 he moved to Derby County for a fee reported to be around £1 million. He had two seasons as a regular in the Derby side, and gained the first of 67 caps for Scotland when he made his debut against Wales in May 1997. He moved on to Blackburn Rovers in August 1998 and then to West Ham United in January 2001. He was in the Hammers side that won the Championship pay-off in 2005 and collected an FA Cup runners up medal in 2006. A loan spell with Southampton in September 2007 was followed by a move to Rangers in January 2008, winning a League Cup medal after a penalty shoot-out against United at Hampden. He gained further Scottish Cup winners medals in May 2008 and May 2009, and a Premier League winners medal in 2008-09. After spells with Charlton Athletic, Portsmouth and Southend United, Christian retired from professional football in July 2012. In 2015 Christian was inducted into the Dundee United Hall of Fame due to his role in the Club's first ever Scottish Cup win. Christian was born on this date in Dundee. The new season began in fine style and by half time we had already surpassed our best result of the whole of the previous season! 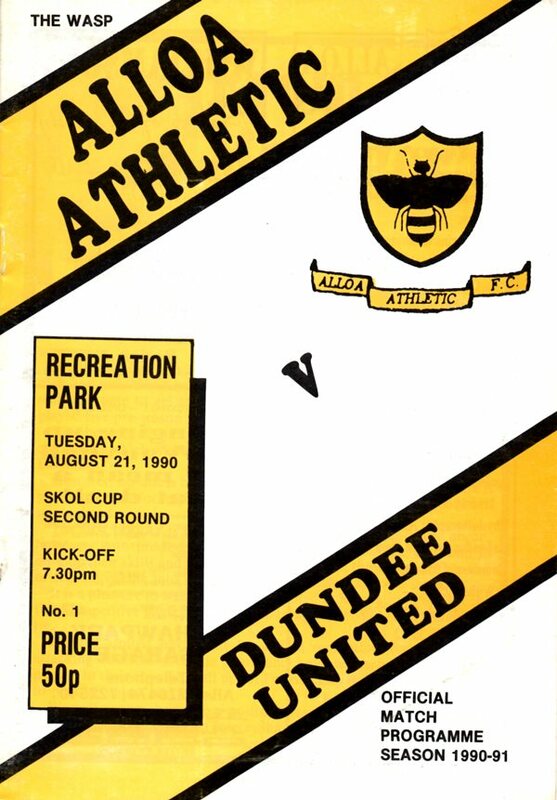 By then we had established a 3-0 lead and effectively killed the tie against an Alloa side newly demoted to Division Two. Our first goal of the new season came after only seven minutes and what a fine effort it was. Billy McKinlay hoisted a high ball out to Darren Jackson on the right and he cut in before unleashing a shot into the top left-hand corner of the net. For United's first and hopefully last venture into the unchartered waters of the play-offs, Manager Billy Kirkwood made three changes. Mark Perry as expected was ruled out because of injury and with Maurice Malpas suspended, there was a new full-back pairing in the form of Rab Shannon and Jamie McQuilken. Ray McKinnon returned in midfield with Owen Coyle dropping down to the bench. For the neutral this was pure theatre, with United fans having to endure agony before the ecstasy of Owen Coyle's extra-time winner which brought Premier Division football back to Tannadice. Backed by the vast majority of Tannadice's biggest crowd of the season.